The patient is a 66-year-old gentleman with glioblastoma (WHO Grade IV) diagnosed in October of 2014. Sections show a primary brain neoplasm with marked nuclear atypia, necrotic foci, and microvascular proliferation. The patient underwent craniotomy (resection) followed by chemotherapy and radiation. He had a recurrence in March of 2015 and underwent repeat tumor resection. In October of 2015, the patient presented with excruciating right hip pain and weakness. He reprts a history of having fallen on the hip four weeks prior. X-rays did not show evidence of fracture. MRI, however, showed extensive abnormalities throughout the pelvis extending into both femurs. The right femur had a pathologic fracture, which was biopsied. The core biopsy of the right femur lesion shows tumor cells with identical morphologi features as those present in the original brain biopsy in 2014. 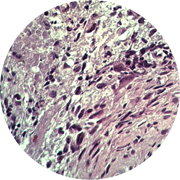 GFAP and OLIG2 immunohistochemical stains (performed by an outside consulting neuropathologist) were both positive in the tumor cells. Pan Cytokeratin and CD45 immunohistochemical stains were negative. Metastatic glioblastoma has a reported incidence of between 0.4% and <2% and has been seen in lymph nodes, liver, and bone. Bone metastases usually involve the vertebrae; involvement of extra-axial bone metastasis is exceedingly rare.